Under the supervision of National Students' Union of India (NSUI) degree holders staged demonstration against unemployment and demanding quick solution to this problem, on Wednesday at Board Office square. Graduates and Post graduates from different streams polished shoes as a sign of increasing unemployment in the country. According to NSUI activists, Prime Minister Narendra Modi had assured employment for the youth during the 2014 Lok Sabha elections, but in vain. 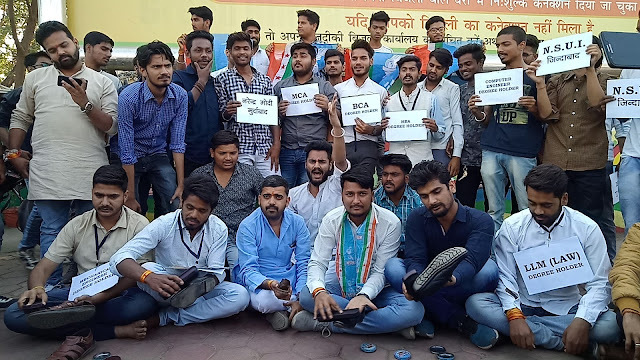 District President of NSUI Ashutosh Chouksey said "This time Modi cannot count on the votes of youth with his fake promises as he did in earlier elections." He also said that "Taking experience from their previous elections, the youth won’t trust him again." The group of young degree holders were angry and shouted slogans against Modi and the ruling party in the centre. They are eagerly waiting for the response from the governments' side.